The postal authorities of the Menshevik government of Georgia (1918 - 21) did operate an effective mail service, both domestically and internationally. It is not hard to create a postal history collection for this period though few collectors try to do so. 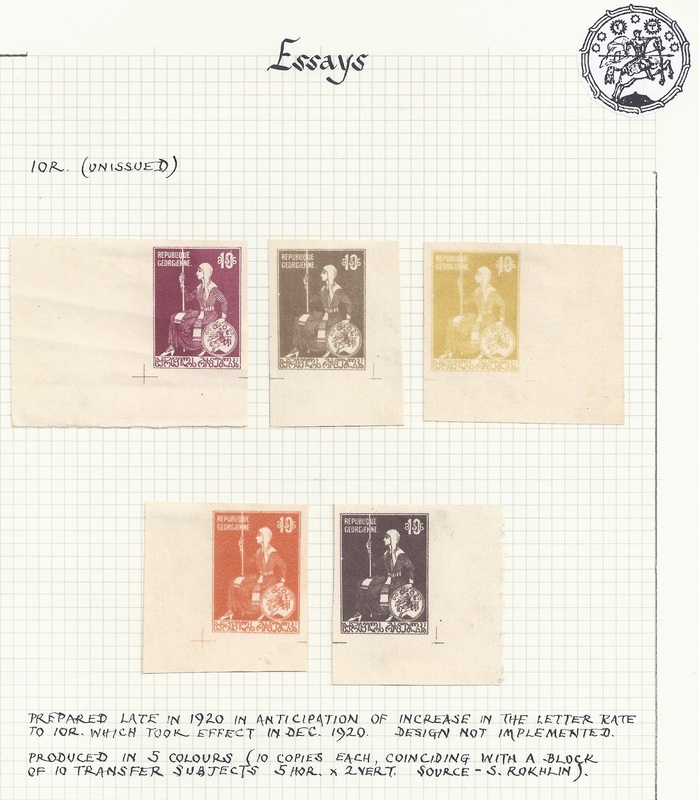 But the authorities also produced a great deal of philatelic material for sale to the stamp trade and collectors. This included Proofs, Colour Trials, Printer's Waste [Makulatur], and the well-known range of "Freak" varieties on the St George and Tamara issues. Most of these are not difficult to obtain and are not very expensive. However, this is not true of the Essay for the unissued 10 rouble Tamara. Collectors quite often ask me if I can supply an example, and I have always had to say "No - I've never seen one". Now I have and illustrate below the group which was in the Peter Ashford collection. Click on the Image to magnify, and you will see that Ashford gives an account based on information from "S.Rokhlin" - the "Ro..." half of "Romeko". All five examples have the house mark of MAISON ROMEKO PARIS. Rokhlin lived in Tiflis until early 1921 when he left for Constantinople. He was already philatelically active. He claims that for each colour of these Trials just one block of 10 (5 x 2) was produced. This does not seem likely given the very large quantities of other material produced. 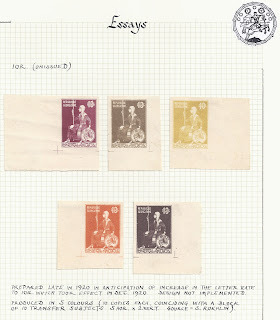 However, these stamps - the examples here are on thin card / thick paper - are undoubtedly rare and it is possible that Rokhlin had a monopoly on them. I wonder if any of my Readers have copies?